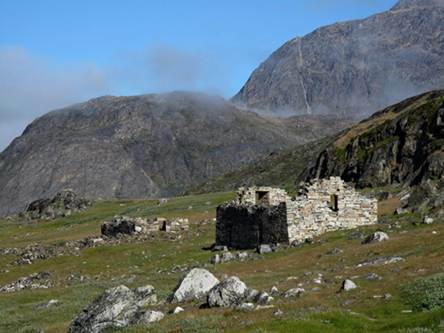 The beginning and end of the Norse settlements of Greenland are tied to climate change. 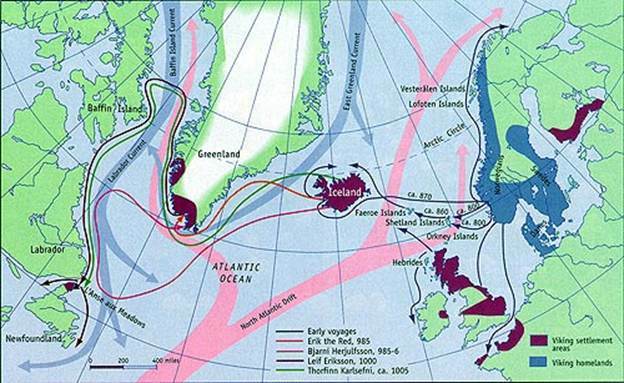 Warmer temperatures during the Medieval Warming Period, beginning around 950 AD, resulted in opening of Northern passages and allowing sea travel along present-day Iceland, Greenland, and the Canadian Archipelago. Beginning in 985, settlers on Greenland set up farms and traded iron for ivory with the nearby Inuit. However, the colonies collapsed by the fourteenth century, due to a multiplicity of factors, including environmental degradation resulting from agriculture, the cooler climate of the Little Ice Age, which closed the boat channels, cutting off contact with Norway, and competition and conflict over dwindling resources with the Inuit. Greenland is a large island located just east of the Canadian Archipelago. Its climate is very cold, average temperatures range from 16 to 45 degrees Fahrenheit, and approximately 80% of its surface is covered in ice. Beginning in 2500 BC, Greenland was inhabited by several sequential Paleo-Eskimo cultures who survived primarily off of whale hunting (Brown, 2000). The Medieval Warming Period (MWP) not only brought relatively warmer temperatures to Greenland but, coupled with new agricultural technology, led to a population boom throughout Europe. Resulting population pressures fueled expeditions and through newly opened channels throughout the Northwest, culminating in the settlement of Iceland. 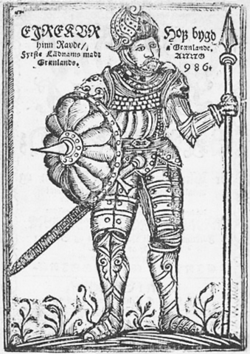 In 984 an Icelander named Eric the Red killed a man and was banished from the colony, and exploring neighboring Greenland, which had been previously discovered by the Norse, he settled the most hospitable region on the southwest coast (Fagan 2008). Over the next few hundred years, more settlers arrived, inhabiting three general areas along the southwest coast. Even though the climate was not very amenable to farming, the Norse continued their European traditions of dairy farming rather than adapting to hunt whales and seals. Even with the warmer temperatures of the MWP, Greenland’s climate was still very cold and had a short growing season, typically lasting between August and October. This left the population at high risk of starving in bad harvest years. 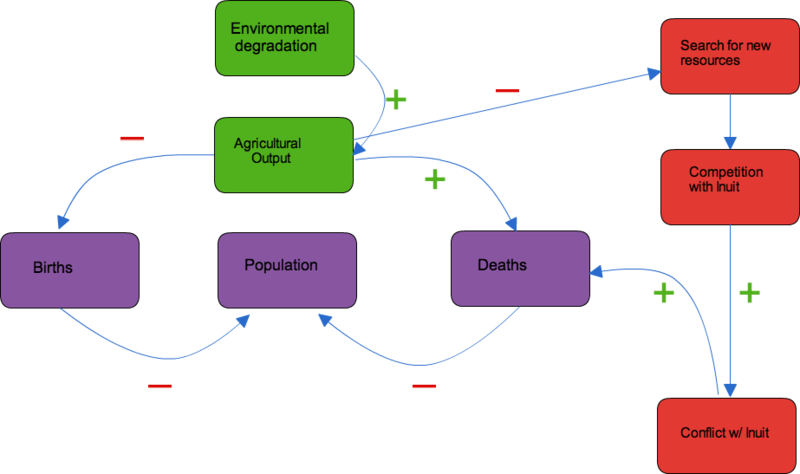 Additionally, centuries of farming led to soil depletion and other forms of environmentaldegradation such as deforestation for firewood, decreasing crop yields overtime (Brown, 2000). Because of their substandard agricultural production, the Norse partially relied on trade with European countries who sent ships with timber, iron, and salt in exchange for dairy products, pelts, and ivory (Fagan 2008). Beginning in the fourteenth century, Inuit began to settle along Norse settlements on the coastline, however relations were generally cordial and a trade relationship between the two groups developed, with the Norse providing iron for spears and tools, and the Inuit providing ivory from hunted animals. However, things began to take a turn for the worse with the start of the Little Ice Age around the thirteenth century. Colder temperatures further decreased the growing season, leaving settlers and their livestock at risk of famine. Deforestation intensified as wood was sought after to warm homes. Colder temperatures also closed the channels that brought the Norse, cutting off their contact with Europe, and the crucial supplies they provided. As resources dwindled, competition between the Inuit and Norse intensified, with the former raiding settlements for supplies in some cases. While the Norse population did not completely die off, by the fifteenth century, their settlements had largely been abandoned (Brown, 2000). 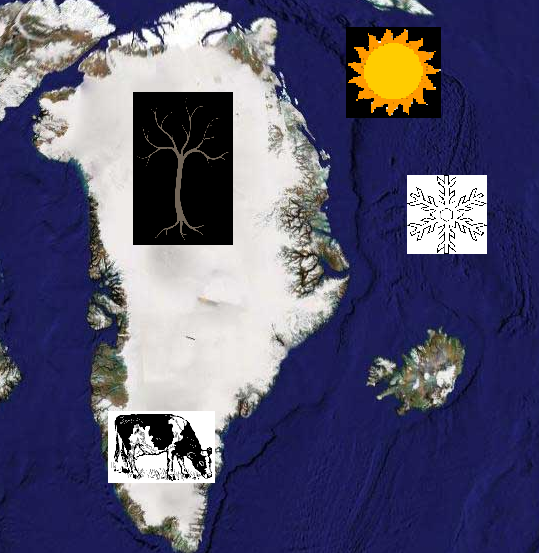 The beginning of the Norse settlement coincides with the Medieval Warm Period (approximately 950-1100 AD), and their decline with the end of that period and the start of the Little Ice Age (approximately 1300-1650 AD). This change in temperature exacerbated food shortages, disrupted trade relations, and increased conflict with the Inuit over dwindling resources, culminating in the settlement’s demise. The approximated trade route used by the Inuit (Thule) and the two major Norse settlements can be see on the right. Norse: Also known as the vikings, these people of Danish and Norweigan descent were early explorers, sailors, and merchants who explored and settled throughout much of the North Atlantic, as well as parts of Europe and Asia throughout the seventh and tenth centuries (Park). Inuit: An indigenous people still living in the North Atlantic. They are descendants of the Thule, another paleo-Eskimo culture, and settled areas of Greenland and the Arctic Archipelago beginning around 1000 AD. Climate Change: Medieval Warm Period: Warmer temperatures melted ice, opening the Northwest Passage to boat travel. Warmer temperatures allowed settlers to set up European-style farming and other forms of agriculture. While the land was not ideal for agriculture, because low quality soil, relatively short growing season and still cool temperatures, their livelihoods were supplemented through trade with European ships able to pass through open sea channels. Climate Change: The Little Ice Age brought colder temperatures, closing trade routes as ice accumulated and obstructing receipt of crucial supplies from Norway. Growing seasons were subsequently shortened, decreasing food security for both settlers and livestock and greatly heightening risk of starvation. Environmental Degradation: Overgrazing: Over centuries, the intense farming techniques of the Norse contributed to soil depletion and erosion, causing a loss in fertility and lowering yields. Overgrazing by dairy cattle and other livestock added to this degradation. Environmental Degradation: Deforestation: As temperatures plummeted, more wood was needed to warm homes, accelerating deforestation, further degrading soil quality and lowering agricultural yields. 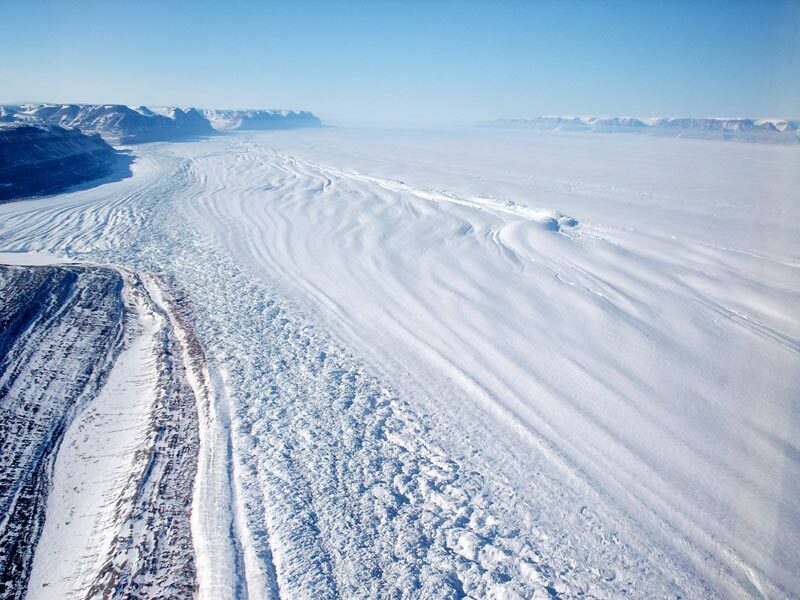 Located near the North Pole, Greenland had very cold temperatures year-round, even during the Medieval Warm period. Most of the country is covered by an ice sheet, and the parts that are not are generally covered with permafrost. Plant life is scarce, mainly consisting of single trees and scrub (Jensen, 2003). Temperatures during Norse settlement likely ranged between 16-45 degrees Fahrenheit, and dropping lower during the Little Ice Age. Worldwide warming contributed to crop surpluses and and population pressures, leading countries like Norway to send out explorations to find new lands to settle. 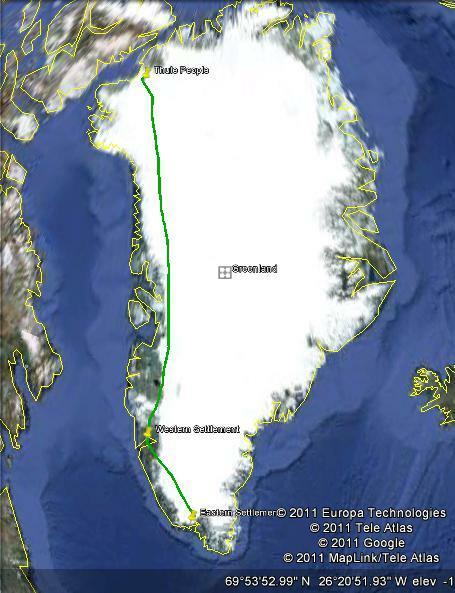 This warming also opened sea passages and allowed parts of Greenland to be more hospitable to farming and settlement. However, with dropping temperatures resulting from the Little Ice Age, growing seasons shortened, sea passages closed, and Greenland became isolated and in danger of starvation. Conflict between the Norse and Inuit arose from competition over dwindling resources, which was aggravated by natural environmental changes resulting from the commencement of the Little Ice Age. Armed conflict was a factor in the demise of the Norse, but not one of the most significant. Competition and subsequent conflict over resources increased between the Norse and Inuit as temperatures dropped. Changes in temperature did not directly result in conflict, but rather exacerbated underlying problems, such as already meager agriculture, impeded trade routes, and increased competition over dwindling resources. These pressures caused some conflict with the Inuit, but ultimately isolation coupled with an inhospitable environment led to the Norse’s collapse. There is no clear winner in this scenario. It can be argued that the Inuit, whose descendants still maintain a presence throughout Greenland won because of their ability to adapt to the environment, unlike the Norse. The Inuit did not rely on agriculture, but lived off of the more plentiful marine life. Their boats were well-adapted to hunting even in icy waters, and their housing and clothing kept them warm during the ever-colder winters. Nonetheless, conflicts between the Norse and Inuit were very small in scale and did not play a significant role in the society’s collapse. Rather, the inability of the Norse to bend to nature led to their eventual downfall. Although the Norse settlement is long gone, it still carries with it important implications to climate change today. While the Medieval Warming Period (MWP) and the planet’s current warming stem from different causes, they both have similar effects on the environment, and therefore it is important to learn from past mistakes. The MWP allowed for exploration and colonization in brand new areas, as ice melted and crops were able to be cultivated in new regions. Similarly, today’s warming will allow for newly habitable regions to develop in Northern Russia and the Arctic. Developments in farming and transportation technologies will mean these populations are less likely to perish from isolation and starvation than the Norse, but the fact remains that people are too eager to test nature, and forget that it sometimes pushes back. This problem has implications for other regions and climates facing global warming today. Populations living in unsustainable ways, such as most of the United States, will one day run out of resources if other sources of energy are not implemented. As water resources plummet, communities dependent on others for water access will need to move, or face devastation. It is necessary to plan long term when establishing a community, or at least employ adaptations immediately to avoid rapid decline. Brown, D.M. (2000). The fate of Greenland’s Vikings. Fagan, B. (2008). The great warming: Climate change and the rise and fall of Civilizations. New York: Bloomsbury Press. Mandia, S.A. No date. Vikings during the Medieval Warm Period. Retrieved from http://www2.sunysuffolk.edu/mandias/lia/vikings_during_mwp.html.